I really can’t believe I’m going to say this, but I’m thankful for the snow we had this week. It didn’t come without its down side…three snow days with all six of us cooped up in the house, treacherous roads, cold temperatures, etc., but snow brings out a desire to play outside that my children don’t seem to have in the hot summer. I would bet they spent more time outside the last three days running, playing, using their imaginations and being creative than any three consecutive summer days I could put together. Our kids range in age from 11 to 2 years old. The two year old believes whole-heartedly in the ‘no child left behind’ act. If the older ones are going out, by golly, she is too! And of course, if she’s going out, either my husband or I also have to go out. Therefore, I would bet we’ve spent more time outside the last three days running, playing, using our imaginations and being creative than any three consecutive summer days I could put together. This all may sound like I love the cold, the snow and winter. None of that is true! In fact, the older I get, the more appealing being a Florida snow bird sounds. But I do like variety and a break in the normal routine. Snow provides that a few days every winter so I’m thankful for it. This entry was posted in Thankful Thursdays and tagged family time on February 11, 2010 by Amy. It’s almost mid-February. We live in Michigan. It’s supposed to be cold and we’re supposed to get snow. While it has been cold here, we have dodged snow bullet after snow bullet this season. We’ve empathized with (ok, laughed at) our friends and family from places like North Carolina who were getting dumped on while we escaped with only a dusting. Last week, when the nation’s capital was covered in a record snowfall, we only got a couple inches. Normally, even a couple inches would sour my mood, especially this late in the season. But I found myself feeling a little left out. We haven’t had a snowball fight. We haven’t built a snowman. We haven’t gotten any pictures of our 2 year old really playing in the snow. We haven’t had any snow days. We’re gettin’ it now! About 5 inches so far and another 4-6 to come tonight. That still pales in comparison to what some areas of the country saw last week. We got our snow day (and I think we’ll get one tomorrow, too). We got the pictures of the two year old. Do I have to share this with him? This is hard to walk in! The dog thought it snowed just for her, she ran, she jumped, she ate it, too. It’s not good for packing so no snowball fights or snowmen. Just good family fun. And exercise. Oy! Pulling that sled and trying to run in the snow. Ok. We got it. We had fun. I’m done now. Is someone gonna pull me on this thing or what? This entry was posted in Magical Memories and tagged family time, sledding, snow on February 9, 2010 by Amy. 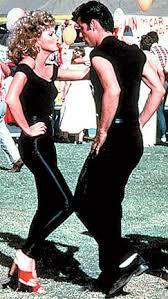 Danny and Sandy may have made it famous in Grease, but it fits my husband and I so well. After nearly 21 years together (oh my gosh, does that make me feel old) we’ve got a system. Especially when it comes to parenting. We agree on discipline 99% of the time. When one of us is about to strangle one or several of our children, the other is always. always. calm. There has never been one time when we both thought we would lose it. When our world turned upside down 17 months, 1 week and 7 hours ago (but who’s counting) by him being laid off we began spending all day and all night together every day. He now works from home and I am a stay at home mom. That kind of togetherness is usually reserved for retirement. A time in life when, if you’re lucky, you have some financial and other freedoms that allow you to get out and enjoy life together. It’s a different experience when you’re broke and still have four young children at home. So how has all of this togetherness impacted us? You’ve heard the expression “familiarity breeds contempt?” I wouldn’t go that far. We still get along very well. We still love each other. We still have faith there are brighter days ahead. But, a break would be nice. I don’t mean the kind of break Ross and Rachel took on Friends. I just mean a little time away from each other. We got that this week. Rather unexpectedly. He left yesterday at noon for Chicago and is on his way back now. I’m sure he enjoyed the drive–time for thinking, music, quiet, maybe prayer. I know I enjoyed yesterday! Our youngest went down for her nap just before he left and slept until after the other kids came home from school. I had lunch, watched TV, listened to some music, played a couple video games, did some housework…for three hours yesterday it was all about ME ME ME ME ME! Today was different. Well first, I overslept (hearing the alarm would be another thing he’s good at). But, I still managed to get three kids up and out the door in 15 minutes. They brushed their teeth and had breakfast. I’m not sure they put on clean underwear, though. So you’ve also heard, “absence makes the heart grow fonder?” Yup! This entry was posted in Parenting, This and That and tagged family time, Parenting on January 27, 2010 by Amy. Nature vs. nurture. It’s the age old question when it comes to parenting. Our children love to read. Personally, I think they were born with an affinity for books–nature. But, My husband and I have encouraged that affinity at every turn–nurture. We began reading to our children when they were just weeks old. Once our oldest son was crawling, he would crawl to the bookshelf before he would crawl to the toys. Our youngest son, was a little harder to motivate. Once he got in school, he was expected to read books that challenged him. The trouble was, in order to challenge his reading ability, the content was too mature. He was in first grade. He still wanted pictures and large-print. Eventually, he found some books he loved and it was like flipping a switch. Our nightly routine includes family story time before bedtime. If you can’t read, someone will read to you. If you’re learning to read, you’ll read to someone. If you are an established reader, you’ll read to yourself. Occasionally, we’ll read a book together. While many parents struggle to get their kids to read, we often have to tell them, “Put the book down and go outside.” or “No, you can’t read just one more page–it’s time for bed.” A fact we’re really not complaining about. One of our fondest Christmas traditions is sitting in front of the tree on Christmas Eve reading The Night Before Christmas. I used to read it. Now, I mostly listen. We have more than 1,000 books in our collection of children’s books–including little board books to classic novels and everything in between. So it seems fitting that we share our love of books with others. Thus, a new category begins on My Chaotic Bliss: “Books We Love.” Future posts will highlight some of our favorite authors and titles. We hope you’ll find something here to share with your children and that you’ll suggest your favorites to us. This entry was posted in Books (and other stuff) We Love, Magical Memories, Parenting and tagged family time, holiday on January 17, 2010 by Amy.